Two very different mornings of birding on the Dee. Thursday was lost in the fog. The suggestion of mist from Tuesday had thickened into a real "pea-souper". By contrast today was, stunningly clear, brilliantly birght. Thursday was actually quite interesting. I arrived early hoping the sun would burn off the white wall of water vapour. That never happened. When I arrived there were none of the usual reference points out on the estuary. All scale and distance was impossible to judge. So much so, I mistook a Curlew and a Dunlin for a dog walker and their canine pal. I kid you not! Only when I got them in the scope did I determine their true nature. It was that foggy. There were birds about but they were nervous, a lack of visibility keeping them from settling for too long. You'd think that would be that for ring spotting, not so. After a few minutes a ringed bird appears from the mist. A Knot. It was ringed in Canada, a white flagged tibia ring indicates it's origin but it is the mud on its legs that prevents the full code being obtained rather than the fog. A near miss. So today I'm up and out early pointing the Super Deluxe towards Thurstaston and pedalling like crazy to maximise time before work has to start. Plan is to hit the shore and connect with colour ringed Knots and Godwits. There is a possible new Blackwit around and I'm eager to track it down. Light is awesome today, view through the scope is stunning. Everything is pin sharp compared with yesterdays somkey fuzziness, colours are vivid as opposed to a grey monotone. Trouble is the fog lifting seems to have allowed all of yesterdays 700-odd Blackwits to leave. Same with the Knot. It takes half an hour to locate the Knot, but the Blackwits remain elusive. The Knot are too far out for ring manoeuvres but there are thousands of Redshank close in. Heaps. Many more than earlier in the week. Red legs glow in the early morning sun. The tide is flooding and it puts up the Knot. They look like a thrown scarf as they fly towards the marsh. Imagine it for a second, if you can't get a scarf and pitch it across the room. 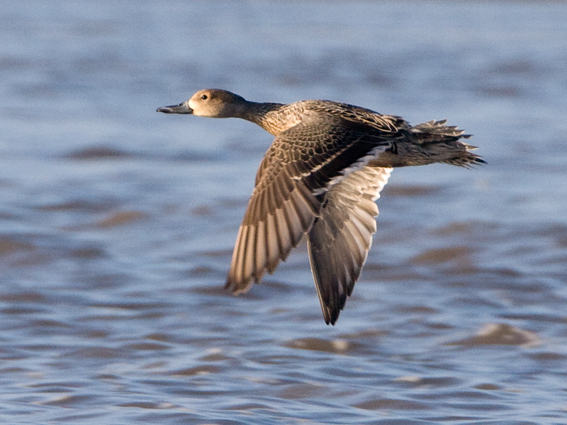 The Knot do resemble the shape it makes as they fly past. Look out for it next time you are on the mudflats. I look around and there is nobody else on the beach, absolutely noone. Just me and the birds. Awesome. The only sounds are the calls of Dunlin, the bubbles of Curlew, the laughter of Shelduck, the piping of Redshank and the swearing of Oystercatchers. 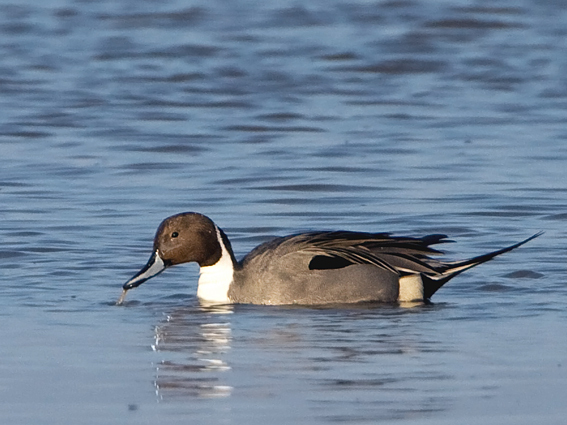 A couple of Pintails drift in on the rising water hooting to each other. Small parties of Dunlin zip past on their way to marsh roosts. Rag-tag lines of Redshank follow. The sound of wing beats rush overhead as I search the Redshank for a Spotted one. looking up I can see lots of Knot heading high in a north westerly direction, using the cleared sky to leave the Dee. The Pintail drift closer and a majestic male gets close enough for a couple of pictures. His female counterpart is a little more camera shy but I get her as she flies past. The water is lapping closer and the flats are nearly gone and so are the birds. Feeding time done for the duration of high tide. Their work is done for now but mine is about to start. The kit is stowed away as the first visitor to the beach appears. They could assume that the beach is a rubbish place for birds with the scene they are greeted with, just sea and sand. If only they'd been here an hour ago.